11.0" X 14" X .25" WEIGHT 18.5 oz. Experience the peace of mind and protection of PakProtect. A portion of every sale is given to the COR Foundation. COR is a 501(c)3 not-for-profit organization developing more compassionate student leaders and preventing violence in schools and colleges by translating scientific research into school-based youth interventions. 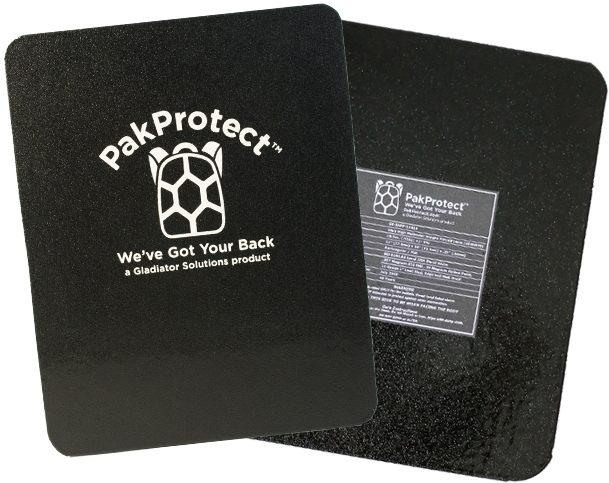 PakProtect is manufactured and distributed by Gladiator Solutions™, a leader in the ballistic protection industry, providing life saving solutions for Federal and State Law Enforcement Agencies, First Responders, National Armed Forces, and Independent Security Contractors. We have applied those same capabilities and principles to the design of PakProtect, ensuring the highest level of protection for students and business travelers. Our products provide extreme lightweight, incredible comfort, maximum strength armor solutions at affordable prices, without compromising performance, durability or quality. Our plates absorb the round rather than deflecting and spalling like steel, or fracturing like Ceramic. RDT spreads the kinetic energy delivered by the round from the point of impact to the surrounding area, diffusing the forces of impact over a larger area and dispersing the force of the round impact. To ensure the highest quality solutions, we test PakProtect plates to and beyond NIJ (National Institute of Justice) standards. While most testing is conducted with the widest spread for impact points (to reduce the kinetic energy absorbed by the armor material), we target the smallest area possible with the highest concentration of kinetic energy in a localized area of impact, providing Gladiator Solutions with the confidence that we are providing our customers with the highest strength to weight ratio solution. Our product is manufactured from high strength, high durability Ultra High Molecular Weight Polyethylene (UHMWPE). The performance of this material enables PakProtect to provide a 10-year warranty. While other products tend to break down over time, our products provide a long and unsurpassed service life. We conduct our sales in accordance with Department of Justice (DOJ) and International Traffic in Arms Regulations (ITAR).